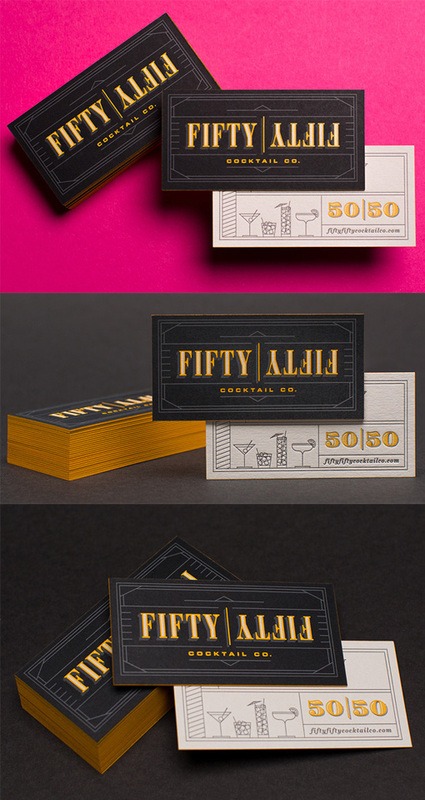 This beautiful business card set for a cocktail bar uses vintage styling, typography and themes from the Art Deco era in a stylish and expertly executed design. The cards have been produced using a number of techniques - letterpress, silk screening, edge painting and duplexing. This has all been done by the one professional letterpress printing studio and the print job is perfection itself. Centering the design and cutting the cards such that the borders, which are near the edges of the cards, are exactly even is actually quite difficult and these cards have come out perfectly. A complex print job like this one isn't cheap but the result is amazing. For Fifty Fifty Cocktail Co.